Mainstream historians claim that the very first gassing of 850 human beings at Auschwitz occurred on Sept. 3, 1941, in the basement of building no. 11 of the Auschwitz main camp. It is supposed to have lasted 15 hours, followed by another two days of ventilation and removal of the corpses. or in December of 1942.
or Russian POWs and sick Polish detainees. 200, or 300, or 500, or 696, or 800, or 850, or 980, or 1,000, or 1,400, or 1,663 victims. or through openings above the doors to the cells. or partly cremated and partly buried. 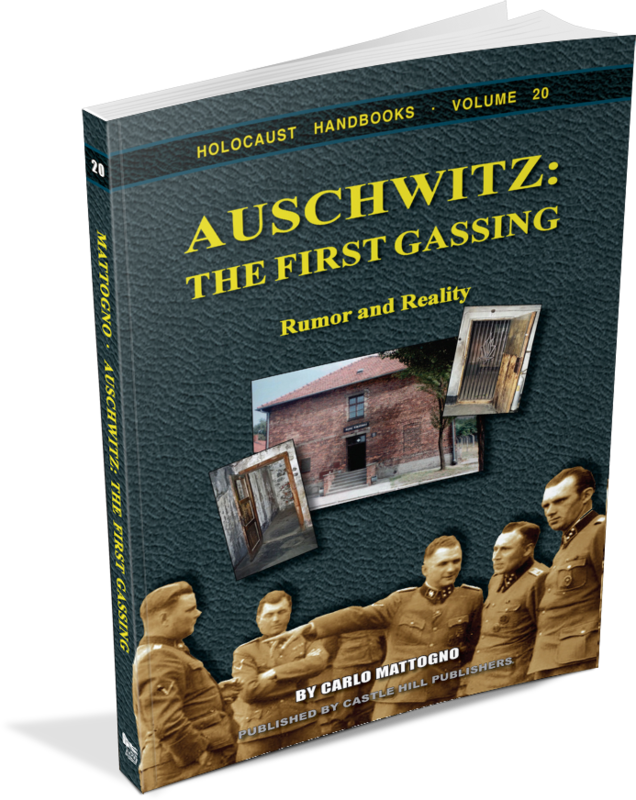 In short, it is evident that those giving the accounts of the first gassing at Auschwitz were either not there, lying or mistaken—and Mattogno exposes their obvious fabrications. This total chaos of claims regarding the very first gassing at Auschwitz is typical for all other accounts of homicidal gassings during the Third Reich. It makes it impossible to extract a consistent story. 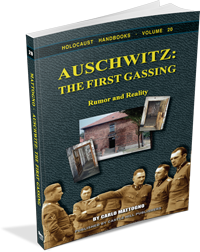 Using original wartime documents, Auschwitz: The First Gassing by Carlo Mattogno inflicts a final blow to the tale of the first homicidal gassing. 3rd, slightly corrected edition, 190 pages. Format: pb, 6"×9", 55 illustrations, bibliography, index.